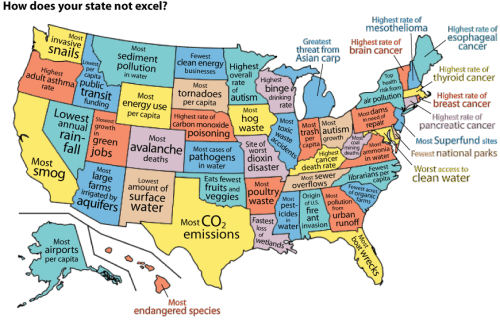 What does your state do best and worst when it comes to the environment? It is terrible that my state, Pennsylvania, has the most dams in need of repair. In my classes this semester, I have learned a lot about water. Pollution, natural/unnatural disasters, and scarcity have come up a lot, but dams are a part of almost all of these situations. Dams are bad for a few reasons. They create sediment build up, causing the Earth’s crust to sink under that area. They create poor water quality because the nutrients coming from upstream are blocked by the dam, which causes inadequate distribution of nutrients downstream. Dams also disrupt the migrating patterns of aquatic life, so some die out. Lastly, dams diminish biodiversity as a result of the build up sediment and standing water and create the loss of bottom land, which is bad for farmers. As if this wasn’t enough, dams that are are incorrectly managed or in need of repair, like the ones in PA, wash chemicals and building materials downstream. However, if these dams are removed, there are also many adverse effects, including floods and higher water levels. The most adverse effect of dam removal is the strain the extra water will put on other dams downstream. This extra weight causes THESE dams to breakdown, causing this all to happen again. As you may have realized by now, there is no right way to go about dam degradation and removal. Perhaps the United States should work on these problems in their societies! Other states that have bad water practices as well are New Mexico, Nevada, Arizona, Montana, Mississippi, Tennessee, and Maryland. Step up, and help save our water! For more info on this subject and for the good things about the states, visit the Mother Nature Network.